FIND THE MOST RECENT VERSION OF SCS. Try to find out if it's stable. If so, use it. Now, more specifically, here is the information you need as of right now, April 2019. SCS is not in a very stable state at the moment, so you have a few options. OPTION 1) Use SCS v32. It is in beta, currently at release candidate 10. It is fairly stable but DavidW is actively fixing bugs. It's very, very good, and adds some very cool new features. But, use at your own risk. OPTION 2) Use SCS v31, the last stable official release. This is the last, best version of SCS with the feature set you may be familiar with from versions ~21 through 30. It includes a lot of bugfixes provided by the community, and which were formerly in the BWFixPack. OPTION 3) What I am personally using right now: the last commit of v31 after its official release. This has a few bugfixes and a little bit of the code that would later go into v32, which makes the AI components install [i]much[/i] faster in games with lots of mod-added kits. I personally think this is the last, best version of v31. The BiG World Fixpack includes the patches required to install SCS v30 on EE 2.0+ and also K4thos' EET compatibility patches. It also includes a patch from someone else that presumably makes the arrows component (that you had trouble with) work again, although I haven't tested it. This is the basic set of fixes that everyone will get when they apply the Fixpack to a baseline SCS v30. The BiG World Fixpack also includes kreso's latest Revised SCS (Spell Revisions compatibility) patches, automatically applied as an addition to the previous -- if Spell Revisions' folder (spell_rev) is present in the game folder when you run the Fixpack script. (So remember to unpack both SCS and Spell Revisions into your game folder before running the Fixpack script, if you plan to install Spell Revisions later). Okay, I have hesitated to do this, because I think it is contrary to DavidW's wishes about distribution of SCS... BUT people are passing around /override folders with SCS installed, and I think that is even more contrary, so I'll go ahead, for now. As far as I can tell, this version has all of the recent fixes relating to EE 2.0 games. I have also bundled two installers with it: a Windows version of the most recent stable Weidu release (v239.00) and my Mac Weidu Launcher utility for Mac users (which itself contains Mac Weidu v239.00). Anyone who is confused about or has trouble installing SCS, go ahead and try this version and please let me know if it doesn't work. Well, I was focused on issues that have prevented people from even installing the mod. But thanks, I'll add that next time I'm at my computer and make a note of it in the OP. Until then, users take note, if you successfully install the mod, there may be a gameplay bug in the "Improved Mulahey" component. Thank you very much for this sub! I had a SCS installer ie. an .exe file and no folder beforehand. That's why I had problems following your advise. Will check if it works and report back. Smarter mages and priests component (any of the available 5 options) couldn't be installed so I had to pick not to install it in order to proceed with the installation. Will reinstall Scales of Balance now and see how it goes. Bummer for smart mages and priests though. Interesting. When you get a chance can you copy and paste the contents of your weidu.log file into a post here? (In between [ spoiler ] [ /spoiler ] tags, but without the spaces inside the brackets.) Spunds like a mod conflict, so we should try to identify it. Don't worry too much though - if the General AI component went in, you will still see much smarter spellcasters. Those components that you couldn't install are mostly about AI pre-buffing. Good to know I won't be missing much. Not that I understood what those pre-buffs are meant to do - I guess to make mages and clerics even tougher. For a noob at this game I'm fine with that. I still can't install the mod. It does not install initialise mod. Ripping my hair off. EDIT: Let's just forget what I said. It seems to work fine. Thank you for the download. EDIT2: I cannot install smarter mages/Priests as well, so they don't buff. It makes the game almost too easy, hope we will be able to install that soon. I was trying to install this package on clean SoD, but got an error at the beginning. Can you check it? Apparently I messed up when creating the .zip archive. I can look into fixing it once I get back to my computer in the next day or two. Quick question... If I just plan on installing SCS on BG2EE, should I use the regular SCS v30 or yours? I think you'd need the hoftixed one if you're on latest version of BG2EE. - I couldn't get the 'Dispelling Arrows' tweak working, even with critto's fix or my own further attempts to fix it. So I have disabled that component in the .tp2. - I couldn't get the smarter AI spellcasters component to install right with the Tweaks Anthology 'Unnerfed Bard Tables' component, even with @AstroBryGuy's fix. So, don't use bard spell tables that give bards higher than 6th level spells. Or if you do, then change the table after installing SCS. But smarter spell casters works well with normal install? Yes, I just successfully installed the pre-buffing components onto SoD/BGEE with this package. > - I couldn't get the 'Dispelling Arrows' tweak working, even with critto's fix or my own further attempts to fix it. So I have disabled that component in the .tp2. Were there any particular errors during installation? It seems like your fix changed the formulation of the regexp in line 5 of the .tpa file, but I get that error no matter how I phrase the regexp. Maybe it's something caused somewhere else, and showing up in the %workspace% variable? Copied [thac0.2da] to [override/thac0.2da]" at which point the installation window closes itself. It never reaches the Better Calls for Help component. There are no error messages in the Debug file. The only other mod I have installed is the BG1 NPC Project. @jabby that could be a memory thing? Try installing the "initialize mod" component and then quitting. Install any spell tweaks and quit. Install item tweaks and quit. Etc. The mod initialization by itself, and each group of components by itself. It doesn't sounds like a bug or failure in SCS itself - if so there should be an error message and/or content in the .debug file. I followed your advice and installed Initialize Mod, quit, installed Initialize AI Components, quit, and finally installed Smarter General AI, but the installation still terminated after X#KETH. Although there wasn't an error message in the Debug file, after several tries I managed to time a Print Scrn just before the installation window closed. Any advice on what this means and how I can get around this? Thanks. "No space left on device" means: Your hard disk is full. You can not store any more data, neither for SCS nor for anything else. @StefanO My computer has 342 GB of hard drive space free on the installation (C:) drive, and 10 GB of RAM if that is relevant. Is it possible that the installer is just posting a default system error message? Or is it misreading the amount of space I have left? Unfortunately I don't know. Whatever it is, I don't think it's specifically related to SCS. What is that mod with "X#..." files? If there or is on the same file, it could be corrupted and telling your computer there's less space than there really is? Maybe? The only other mod I have installed is BG1 NPC Project. I have attached my WeiDU log. X#KETH appears to be a BG1 NPC Project file since it is located in the BG1NPC subfolder and the Override folder. Maybe there is an incompatibility with these mods. Edit: I just performed a clean install of BG:EE and installed the SCS hotfix without the BG1 NPC Project and it worked. It looks like these two mods are currently incompatible, at least in a BG:EE environment. Edit2: I was able to install BG1 NPC after SCS, so the two mods maybe are compatible if one reverses the recommended load order. I'm guessing any new quest NPCs introduced by BG1 NPC won't benefit from the improved AI though. Thanks for all the help. Did the patch break SCS chunk resistance? I was continuing a no-reload run from a number of months ago (i.e. pre 2 patch) and did a fresh game + SCS install (including chunk resistance). I just had Imoen get chunked by slashing damage from a demon knight. With further testing, it seems I can easily chunk my characters with physical damage. Which I think is what SCS chunk resistance prevents. Anyone have any detail here? The only other mod I have is ascension, which I don't think would be the source of the issue. I also double checked my Weidu log to make sure chunk resitance was in fact installed. No. Scs asks if you want your character to have a easier time being chunked. Enable makes them far more prone to permanent deaths, disable vice versa. That component has always been imperfect IIRC. I think it might apply to some damage types (spell damage?) but not others. Maybe. I'm not really sure. But if it's really important that you be able to play higher difficulty levels without chunking, then just turn down the gore setting in the game options. That is guaranteed to work. I turned gore off and physical damage still permakills. I had actually tried that earlier, but retried again tonight. I don't think there is another gore setting outside of the switch in "gameplay". Is there? "Install component [make party members less likely to die irreversably]"
Previously, the component made it extremely difficult to be permakilled. I believe high levels of elemental damage could do it (dragon breath was an example). But as far as I know it worked 100% on physical damage. It's also an important component for no-reload runs. I don't see why I would be having an unusual issue given my simple install, although I am surprised other no-reload players haven't posted about it. But I am thinking maybe the new patch has something to do with it. A lot of, and maybe even most, no-reload players aren't using EE from what I've seen. Reading in data: spellcodes BIFF may be in hard-drive CD-path [.\lang\en_us\DATA\AR01XX.BIF] BIFF may be in hard-drive CD-path [.\cache\DATA\AR01XX.BIF] [.\DATA\AR01XX.BIF] 35034668 bytes, 354 files, 63 tilesets [./override/ar2003.are] loaded, 1684 bytes BIFF may be in hard-drive CD-path [.\lang\en_us\DATA\OHAREAS.BIF] BIFF may be in hard-drive CD-path [.\cache\DATA\OHAREAS.BIF] [.\DATA\OHAREAS.BIF] 43799040 bytes, 261 files, 12 tilesets BIFF may be in hard-drive CD-path [.\lang\en_us\DATA\SODAREAS.BIF] BIFF may be in hard-drive CD-path [.\cache\DATA\SODAREAS.BIF] [.\DATA\SODAREAS.BIF] 2009144 bytes, 91 files, 0 tilesets Copying and patching 1 file ... [./override/spell.ids] loaded, 26095 bytes ERROR: cannot convert level or %level% to an integer ERROR: [spell.ids] -> [override] Patching Failed (COPY) (Not_found) Stopping installation because of error. This happens during the mod initialization step. The only other mods I've installed so far are Sirene, BG1QE, and BG1UB - nothing that makes any other modifications to spells. Any suggestions? Edit: just tried a fresh install with no other mods - same issue. I have same kind of error here, also on SOD 2.3 on beamdog launcher. No other mods installed. Will uninstall 4 files for [STRATAGEMS/SETUP-STRATAGEMS.TP2] component 1000. Uninstalled 4 files for [STRATAGEMS/SETUP-STRATAGEMS.TP2] component 1000. 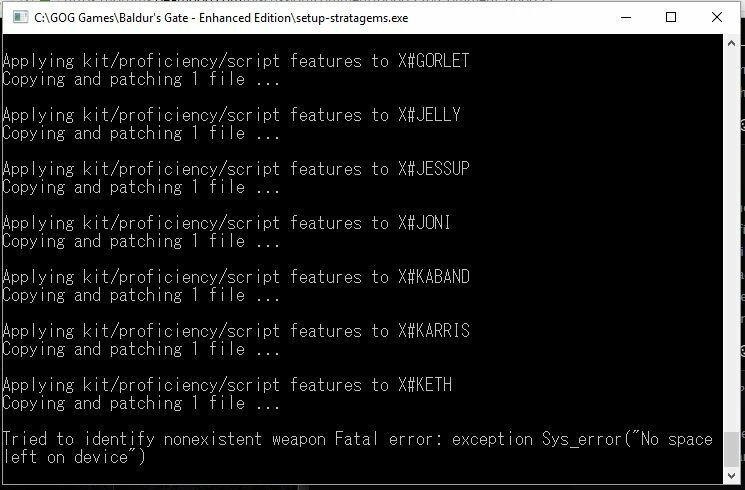 Detailed error information can be found in the file SETUP-STRATAGEMS.DEBUG . For help troubleshooting installation problems, go to the Sword Coast Stratagems forum at forums.gibberlings3.net. Install Component [Initialise mod (all other components require this)]?